« Vacuum Sealed Drummette, Chicken Feet, and Duck Feet! Last night, we threw together a bunch of things for dinner but it seemed so carb-heavy. I tried to conjure up a way to add protein and veggies to our meal and somehow this idea came to mind. 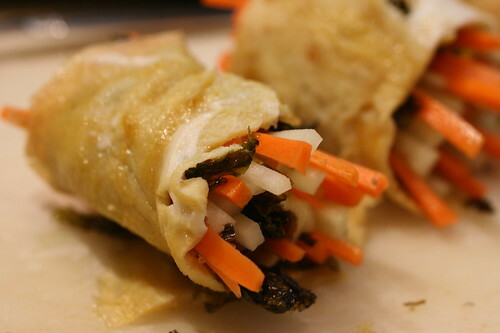 I loved it so much that I decided to make it again for lunch, tweaking the recipe just a bit to make the rolls a bit smaller, and therefore easier to eat. Let’s talk about the ingredients first: The measurement for the julienned veggies (matchstick size) is a very rough estimate. It’s hard to measure that shape. 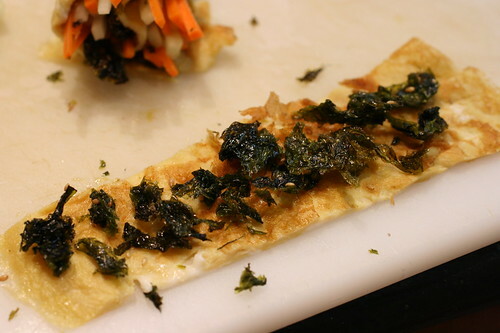 I also want to apologize for having an ingredient called “seaweed stuff”. 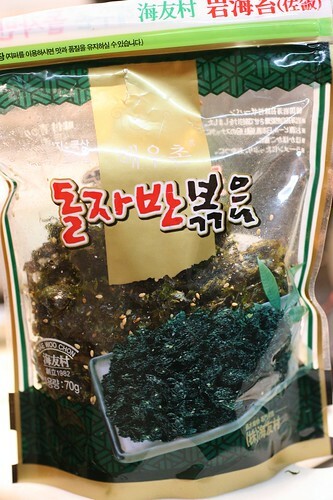 We bought this mixture of seaweed, sesame oil, sugar, sesame, and salt at M2M and it doesn’t have an English name. The packaging is covered in Korean. Can someone help us out? Lastly, if you have the foresight, take your eggs out and leave them on the counter to come to room temperature. You’ll get a more tender egg, but not a big deal, I didn’t. 1. In a small bowl, whisk together eggs, soy sauce, sugar, and mirin. Split the mixture in half (roughly 1/4 cup each). 2. Heat a 8″ non-stick omelet pan with non-stick spray, over medium heat and pour in half of egg mixture. Tilt the pan side to side, and around, until the mixture coats the pan. Keep tilting around while heating until liquid does not travel anymore. Using a temperature resistant spatula, test the egg mixture gently to see if it is firm enough to flip. Turn it over as gently as possible and remove from the pan after just a few seconds. 3. Repeat step 2 with the other half of the egg mixture and let both pieces cool on a flat surface. 4. Cut each egg into 3 strips as evenly as possible. 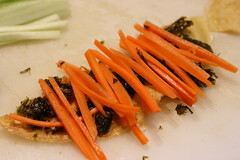 Take 1 tablespoons of seaweed stuff and crumble over each egg strip. 5. 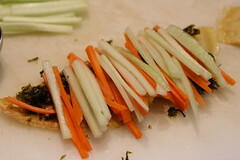 Lay the carrots across and then the cucumber, leaving a little room at the end. 6. Roll them up and leave the open side down. Just in case you want to make it larger, like I did last night, it’ll look more like this, and needed toothpicks to hold it together, which is why I opted for smaller. posted by jessica	at 01:23 PM	Filed under Japanese, Recipes. You can follow any responses to this entry through the RSS 2.0 feed. Both comments and pings are currently closed. I want to say I saw some of that in a local Asian market here…it had a label reading “jaerae chosun” but I don’t know whether that refers to the production method or the ingredients. Sounds tasty, though! Thanks Megan! I looked up Jaerae Chosun (what a memory you have!) and it looks very close. 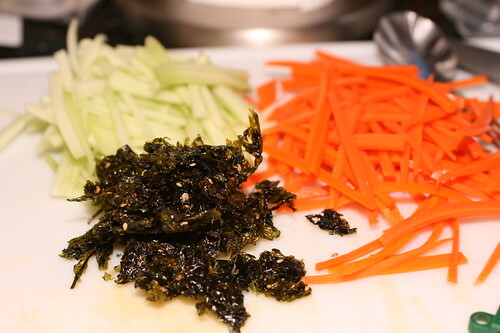 The Jaerae Chosun ingredients are Laver (seaweed), sesame oil, corn oil, salt, and msg. My packet of stuff has Laver, sesame oil, sugar, sesame, salt. I never thought that roll up egg with seaweed sesame stuff(it calls doljaban”돌자반”) Doljaban is kind of side dish which is add some seasoning with Gim. 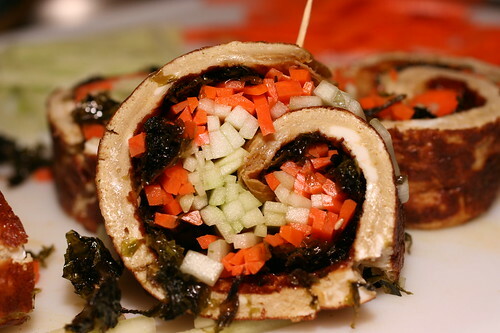 Gim is a kind of dried laver, black and paper-thin and it is used in gimbap. hkfoods, I’m not sure what you’re saying here. Did you use an online translator?